The olm is, without a doubt, one of Slovenia’s most iconic animals. Once, people believed that olms were young of dragons, which were born deep in underground caves. In reality, they are a kind of salamander, which is highly adapted to life in total darkness: it has virtually no pigment and its eyes are reduced to small dots, underneath its skin. Instead, it has very well developed electro perception and finds its prey by minute electric fields which all animal tissue makes. During our reptile tour, we plan to see olms in their underground home. We also go above ground in search for lizards, snakes, frogs and salamanders. And we go bear-watching, even though bears are not reptiles. Together, this is the ideal tour for lovers of reptiles and amphibians. Most reptiles, including lizards, snakes and turtles, love sunlight and warmth. To see them, we go to some of the sunniest parts of Slovenia, and we plan to be out for much of the day. Each species has its own, specific habitat. In order to get to know the species, we drive to these habitats and, once there, we spend our time searching for these animals. Lizards tend to be fairly numerous and with some care, we can often approach them closely without a need to catch them for identification and photographing. For snakes, we expect to need more time. here, teamwork pays off: when several people are searching the same area simultaneously, our chances to see snakes increase significantly. 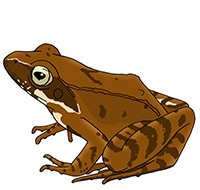 The appearance of the Italian agile frog does not stand out: it is a small, somewhat fragile-looking brown frog. But, wait until you hear them. For this, you have to do a lot of effort. First, you have to be very early in the season: Italian agile frogs only call around February. Then, you have to be at the right place, which isn’t easy, because Italian agile frogs are among the rarest of all European frog species. Finally, you have to bring special equipment, a hydrophone (underwater microphone), because Italian agile frogs call while they are sitting under water. What you then hear is something alike an orchestra of meowing cats, which loudly resonates through the water. Nobody is sure why they call underwater: perhaps this way they avoid owls which catch calling frogs, or they avoid confusion with above water calling frog species, in search of a mate. Our tour takes place too late in the season to listen for Italian agile frogs, but we will certainly try to see this unique little frog, of which some of the best-preserved populations are in Slovenia. In most of Slovenia, vipers are rare. They are shy animals and usually retreat well before we see them. During this tour, we plan to search for them, for which we ask one of the countries experts to join us in the field. This way, we hope to get some good opportunities to photograph them as well. Vipers are just one of a number of snake species which we hope to see. the others are harmless, like the grass-snake, whose main defence is to spray a foul-reeking fluid when he is picked up. Others, like the black whip-snake, rely on speed to escape both predators and interested humans. When a whip-snake is cornered, it tends to bite – fast, but again relatively harmless. During our tour, we aim to photograph reptiles and amphibians in their natural habitat and we keep catching and disturbing animals to a minimum. We arrive at Ljubljana airport where we meet our local guide and tour organiser. Depending on our arrival time we may have a stopover on the way to our accommodation. 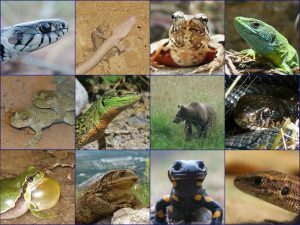 Here, we can see the first amphibians and reptiles in Slovenia! Imagine a large lake, where the water level changes from day to day. In summer it dries up, therefore, there are few fish. In springtime, the lake fills with water and becomes a heaven for frogs and toads. Along the shores, we find especially many Green frogs. Some weeks ago, countless Grass frogs and Common toads have spawned here and now, their tadpoles swarm in the lake. If we are lucky, we may find some newts as well (more newts later this week). Expected species: : Bufo bufo, R. temporaria, Rana dalmatina, Pelophylax lessonae, P. kl. esculentus, P. ridibundus, Lissotriton vulgaris meridionalis, Triturus carnifex, Natrix natrix. In the evening, we go bear-watching from a game-managers’ hide. For a description: see our Blog post on this subject. The Olm (Proteus anguinus) is by far the most charismatic amphibian species in Slovenia. This large salamander (up to 35 cm) is entirely adapted to live in underground rivers and streams. It has almost no pigment and its eyes are reduced and invisible underneath its skin, as adaptations to life in total darkness. Most places where it occurs are inaccessible (networks of small underground streams where we can’t enter) or only accessible to licenced and experienced speleologists. Fortunately, nearby our accommodation, there is a cave which is easier to access. In the company of a local cave-guide, we will spend much of the day exploring this cave. Both the water level and the clarity in the cave are dependent on rainfall in the region. Under favourable circumstances, we may see quite many “baby dragons”. In the remaining part of the day, we will visit a nearby rocky place which has a population of Nose-horned vipers, in the company of a local viper-expert. Day 5Italian agile frog in Slovenia! The Italian Agile frog is a tiny, somewhat fragile-looking brown frog. It used to be common in all of northern Italy, between the Apennines and the Alps. This lowland region, known as the Po-Plane, is used for intensive agriculture now. Italian Agile frogs still live there but to see really strong, natural populations, you have to be in Slovenia. Reason enough to go southwest, to the habitat of the Italian Agile Frog! The further you go south, the more reptiles you may see. So, today, we go to the Mediterranean coast of Slovenia. We expect sun, many flowers, butterflies and, of course, lizards and snakes! We went West two days ago, South yesterday and today, we head East, in the direction of Croatia. Not far from the border, we stop at a special area. Here, we find a habitat type which has almost disappeared from Europe: Old Growth Flooded Oak Forest! This is by far the best place to search for amphibians with especially large numbers of Moor frogs, Yellow-bellied toads and newts! Later in the year, it can swarm with mosquitoes. Now, in spring, the mosquitoes are only a minor inconvenience. Today we pack and, on the way to the airport, we make smaller stopovers when time permits. The price of our custom tours is 1,195 € per person. This price includes 7 nights accommodation, meals, transport in Slovenia, guiding, bear-watching, entrance-fees, transfer between Ljubljana airport and the accommodation. There is a single-room supplement of 135 € per person. This tour is moderately difficult and occasionally demanding. During the tour, we will walk slowly and stop many times, but terrain can be difficult, rocky and occasionally steep, without real climbing. At other places, it may be muddy and we may encounter dense and thorny vegetation as well. Please make sure that you have good hiking shoes and sturdy trousers! We will be out all day in practically any weather type and even sometimes at night. Be prepared for sunny summer days, rain and a cool cave.